Do you get less social from using social media and the Internet? You know, in a way I think that might be true. We spend more and more time in front of the computer, logged in on sites like Facebook, Twitter, LinkedIn and a whole lot of other so called social websites of all sizes. We probably have a lot of “friends” on these social websites (or “followers” as they are called on Twitter), and they’re often spread around the world. We have become very global. However, we’re just sitting there … in front of the computer (or the mobile phone) staring on the screen. We only communicate with our “friends” digitally. It seems we’ve forgotten how to socialize analogically, i.e. in real life (IRL). In a worst case scenario we may even forget to see our families. Another drawback of this phenomena which is social media, is that we apart from forgetting to socialize in real life also become extremely stationary. We don’t move. I don’t think I have to tell you what effects this might have. Now, it does seem like there is a solutions to the problem. 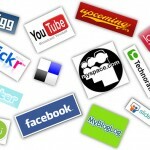 Do you feel that you’ve become to dependent on these social websites? Then you can commit digital suicide. It sounds a bit dramatic, I know, but it’s in fact only a way to liberate yourself from the bonds which are social media. There’s an online service called Web 2.0 Suicide Machine. It works with websites like Facebook, MySpace, Twitter and LinkedIn. It takes barely an hour to completely erase your digital presence from these sites. At present 4055 people have commited digital suicide. 307,750 friends have been unfriended. 504,978 tweets have been removed since launching. Is social media is a problem for you, maybe an addiction? Then perhaps digital suicide is the solution. A slightly drastic solution one might think. It would probably be enough to get you use of social media a little more structured. Set up some rules for how and when you can use it. Start by turning your computer off. Cancel your Internet subscription. Call a friend, a family member … and communicate in real life. Why not meet over a lunch, a cup of coffee … anything could work, as long as it gets you to leave the alluring glow of the screen. Real life is pretty cool too!